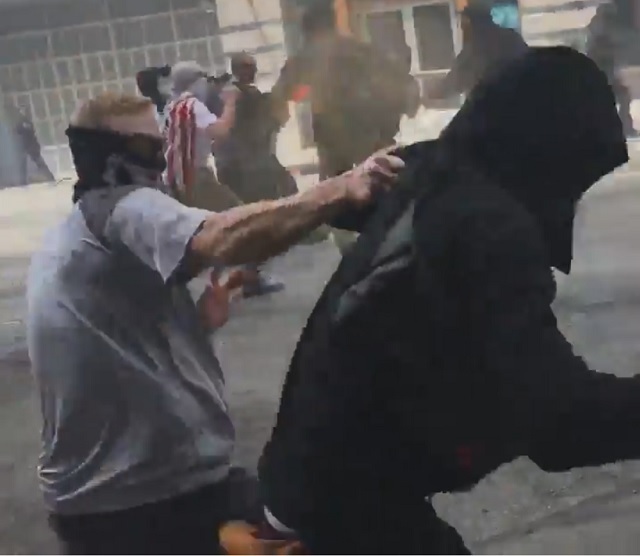 A free speech "Patriots Day" rally Saturday at Berkeley organized by right-wingers ended with antifa radicals being chased down in the streets. A wide range of Alt-Right, ProudBoys, OathKeepers, Trump supporters, and other assorted right-wingers faced off with left-wing Anti-Fascists, BAMN and other leftist groups near the Martin Luther King Jr. Civic Center Park. The LA Times said at least a dozen people were arrest. You can watch an hour+ long stream from Tim Pool above and Luke Rudkowski below. Note, Shane Bauer is a far-left journalist with Mother Jones. Alt-right chant: "Trust fund commies off our streets!" Antifa retreating. Alt-right shouting "Commies go home! Commies go home!" WE WON THE BATTLE OF BERKELEY! !